Thursday, June 21st, I took a train to Schiphol Airport for a flight to Barcelona. It was finally time for Love Fan Fest 2018! I had already checked in online and took an early train so I was very relaxed. This was my second convention and I could already tell things were going to be very different from ClexaCon. Below is my vlog. Don’t forget to subscribe to my YouTube channel! With ClexaCon, every small bit of information was available beforehand and the organization responded to your emails. With Love Fan Fest 2018, I hardly knew anything beforehand. I knew that I had a press pass and that I could pick that up during pick-up hours on Friday. There was a rough schedule on the website but never the “real” one. After finding my hotel downtown, which was very easy, I took my phone and mic and left for the Sagrada Familia. Yes, that is touristy AF but the first time I saw it was roughly twenty years ago and when I saw it again five years ago, it had changed so much that I just really wanted to see the progress now. The heat in the city quickly became too much for me, so I took a metro to the beach and walked along the boulevard for a long time. About five years ago, my wife and I went to Barcelona for a few days right after our wedding and this afternoon, I ended up eating patatas bravas at the beach club where we had lunch twice. I really enjoyed soaking up both the sun and the happy memories. After that, I decided to go for the magic fountains, which would be my third time seeing them but it is always just so chill to sit there and so beautiful to walk around. The fountain show would not start for another two hours but I simply enjoyed eating ice cream and watching other tourists. Going to Love Fan Fest 2018 – or not….? Friday morning, I got up all excited. 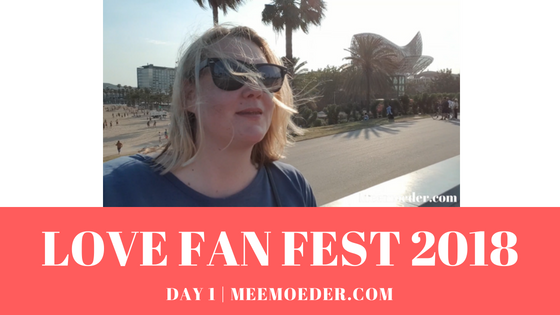 I was mentally preparing myself for Love Fan Fest 2018, thinking about questions that I would ask the guests if I was going to be able to talk to them at all and wondering what to expect. The day before, I had tried to contact the organization again to find out where I could pick up my press pass and whether they had a schedule for me but alas, I received no reply. I took metro line 1, which was around the corner from my hotel and went straight to the official location. I got out and I thought I knew where I was going. You see, I saw the hotel and a straight line to that hotel, so it made sense to me to walk to the tunnel that I saw directly in front of me. As I walked to the tunnel, I started to feel very unsafe as it was a big parking lot, a tunnel, and me. What woman does not become uneasy in that situation? As I left the tunnel, I ended up on a dirt road right next to a freeway. Nope. I was not going there. I walked back, luckily ended up meeting a Dutch guy, and asked for directions. Google Maps was right: it was only a three-minute walk, just not through that tunnel…. When I finally arrived, I asked the staff where I could pick up my press pass. They told me to sit and wait with the other press. I turned around and there were only two others, and one of them I recognized from ClexaCon. What?! That was so cool! Until they told me they had been waiting for 45 minutes already and that nobody knew anything. Eh…. That did not sound promising…. Granted, the wait was somewhat long but not too long (for me at least). It was the outcome that was terrible. There were “no press passes today.” We were to pick them up Saturday morning at 8 am. That was quite some disappointment to process. First of all, it meant a work day less. It also meant we were not allowed to be at Shannon Beveridge’s panel (“not today, no”). And finally, 8 am is early, you guys…. Look, I am a mom; I have to get up early every day but with the welcome party that night and the prospect of working all weekend, I had hoped to be able to get a little more sleep since the festival did not start until 10 am. On top of that, we had to get in the long line because we needed to show the tickets for the extra’s that we had bought. I did not buy anything but a ticket to the Welcome Party, so seeing that long line for a mobile ticket that you were just supposed to show at the door seemed daunting. Then, the long line was redirected to outside the hotel, which meant you had to stand in the blasting heat. Still, I was happy my ticket to the Welcome Party was still valid, seeing that I did not have a pass to the festival yet. I needed a restroom break and when I came back, apparently, we had moved to another line. We had been sent to the registration line when all we needed was the extra’s line. After chatting with others in the line (what else can you do? ), we were finally able to get our tickets checked. Guess what? My ticket did not need to be checked because it was a mobile ticket. Yup, that is right; I was in those lines for no reason. Lol. At this point, I just laughed about it. So, in total, my first Love Fan Fest day consisted of an hour of traveling back and forth and a 2.5-hour wait. I was planning on going to the Earper meetup in the hotel lobby at 5 pm since I was not allowed to go to Shannon’s panel. However, when I got back to the hotel, all I wanted was food. I took the metro to La Rambla and had a nice big lunch. After that, all I wanted was sleep. My quick nap turned into sleeping for two hours straight and when I woke up, it was already 6.30 pm. Woopsy, I missed the meetup. I went for a quick bite at a bar near my hotel and got ready for the party. These are the events that I get nervous about when traveling to a con by myself. I wanted to be there to see what it was like but going to a party by yourself is quite scary. I knew the other press people were coming too but since we were not traveling to the party together, it meant we would be arriving at different times. And yes, I was there alone for about twenty minutes. At ClexaCon, that was no problem at all since they organized speed friending before the con and had two full convention days before their party. Talking to people was no problem at all (outside at least). Here, I did not know anyone and nobody talked to me. Yup, that is as terrifying as you can imagine so if you are traveling to a con by yourself and Love Fan Fest is your first one, I do not recommend going to this party by yourself (if they organize it the same way next year, that is). Luckily, my press buddies came after twenty minutes and I was fine. At 10 pm, I heard this screaming and saw everybody waving their hands. Eh, all the guests arrived at the bar. Lol, I did not know that was even happening! How cool! But wow, how intimidating that must be for them to see an entire club run to where they were at. They were guided to this small room and everybody stood in front of that room, taking pictures. People with VIP tickets were allowed in to talk to them. I decided to go home at around 11:30. After all, the second day of Love Fan Fest 2018 was going to be a long day, starting with the press passes at 8 am. Or was it?